With our lightweight coiling garden hose, you'll never again have to struggle with tangled hoses. The hose stretches to follow your movements, then automatically rebounds into a neat coil for easy storage. Manufactured in the United States using lead-free, top quality FDA grade polyurethane. Commercial grade solid machined brass fittings are plated twice with nickel and then chrome to provide a long-lasting, never-tarnish, durable hose fitting which also prevents lead from leaching into the water. A truly drinking water safe product. Includes specially engineered strain reliefs on both hose ends to prevent hose kink at the faucet or nozzle end of the hose. Features 12-inch tails on each coil end making a very user-friendly product. Our specially engineered, polyether-based polyurethane is designed for long-term water use. Flexible in all weather conditions. Hot, cold, and even freezing temperatures. 3/8-inch inside diameter design. Extremely lightweight--perfect for smaller watering needs on the porch, patio, containers and small gardens. 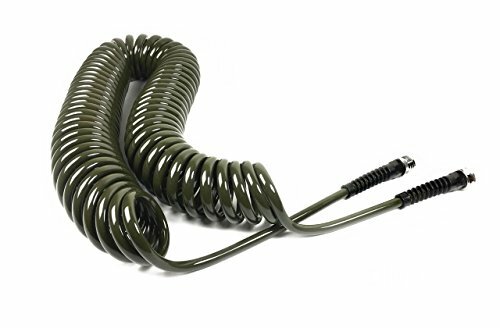 Because it is a coiled hose and retracts, it stretches comfortably to 80-85% of it's length (approximately 65 feet). If you have any questions about this product by Water Right, contact us by completing and submitting the form below. If you are looking for a specif part number, please include it with your message.